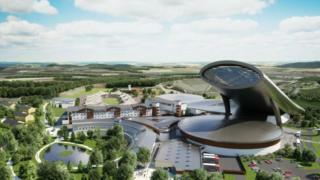 Final details have been lodged for a £300m snow sports centre which has been in the pipeline for 16 years. Mid Suffolk District Council planning officers are considering plans for SnOasis at Great Blakenham, near Ipswich, and are preparing a report to go before councillors. Developer Godfrey Spanner said he was "excited" by the progress being made. "Submission of this additional information marks an important next step in the delivery of the scheme," he added. "We are increasingly excited about the progress being made to seeing SnOasis happen and delivering the significant local, regional and national benefits associated with the development of this unique winter sports resort and facility." It is not yet known when the plans will go before the planning committee. The vision is for a winter sports centre, featuring a ski slope and a speed skating circuit. It will have accommodation for short break visitors and athletes staying longer term to use the development as a sports training facility. The complex is planned to be built at a former quarry site. Mr Spanner said it was because it does not fit in with Network Rail's vision to cut journey times between Norwich and London to 90 minutes. He said he hopes the facility will open in 2020. Onslow Suffolk receives planning consent in 2005 but with conditions "it could not meet"
Mr Spanner is declared bankrupt in 2012 but says the SnOasis project "will not be affected"
A council spokesman said: "We now have the final details which are with our planning team, who are going through every single part of the application in detail. "They are considering it in line with planning law, to make as comprehensive as possible a report to our councillors." Final details received include an environmental statement and a structural report and a waste management strategy. Natural England says there is still "insufficient information to rule out adverse effects to Great Blakenham pit" and Suffolk Wildlife Trust is concerned about dormice, bats, breeding birds and badgers.